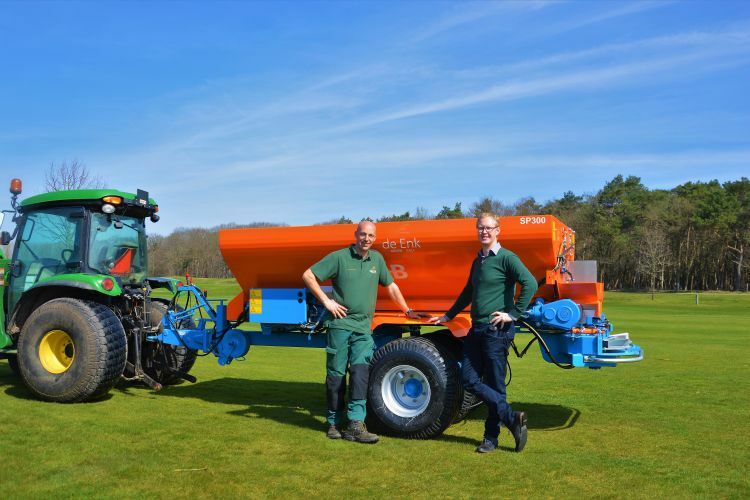 De Enk Groen & Golf is satisfied with the Combinator, the Sandfiller and the sand spreading machines of GKB are boasting at Golf club Prise d’Eau in Tilburg. At first glance, these machines look like default versions, however, they are enriched with several customizations that De Enk deems necessary. ‘GKB is good in turning our ideas into working technique’, says Peter Koop, district manager of De Enk Groen & Golf in Drachten. De Enk Groen & Golf has been maintaining golf courses in the Netherlands since 1973. Currently, they maintain 24 different courses; as of January of this year, they have added a golf course in Nijmegen. Each project is equipped with a balanced greenkeeper team and machinery. On a sunny spring day in April, the three most recent acquisitions are lined up on the fairway of golf club Prise d’Eau in Tilburg. 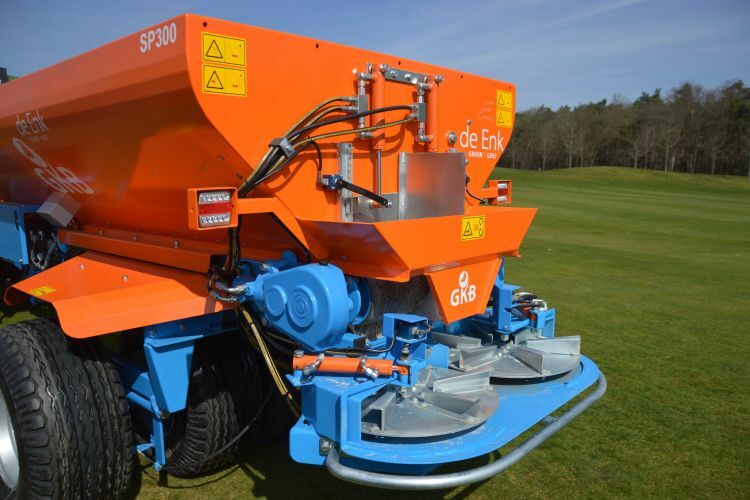 Present are the SP300, a sandspreader, which was developed by De Enk in cooperation with GKB, and Terra Troniq, the Combinator (CB240) and the Sandfiller (SF120). ‘The sandspreader has been here since two weeks now’, says Peter Koop. ‘We measure and scan the golf course with specialized equipment, to check and see what the deal is with the condition of the soil, how the grass grows, or if it needs nutrition, and if the course has deprived or rich soil. The task cards that result from this process can be plugged into the computer that is attached to the Sandspreader. The computer immediately recognizes the areas that were scanned, consequently, the flaps of the Sandspreader open up more, or close a little to ensure that every area receives the right amount of sand. Before the machines would just spread all the sand equally across the course. As a result, De Enk Groen & Golf lost a lot of sand due to areas that did not really need the sand in the first place. This SP300-sandspreader can spread to a width of 8 meters, and it can cover the course in just one operating run. Subsequently, the Sandspreader ensures that only the areas that really need sand, will receive the necessary sand, consequently, less sand is used and required. ‘In this way, we can give the vegetation the exact amount of sand, and thus provide the best growing environment. In addition, we contribute to a better environment with this machine, mainly because we don’t have to drive out as often. Thereupon, the players, the primary users of the course, have little to no burden for us. Jeroen Vingerhoets, the head greenkeeper of Prise d’Eau, indicates what extra innovations he desires for a machine and he tests these as well. ‘Fortunately, he is quite skillful with these computer systems’, says Koop with a smile. 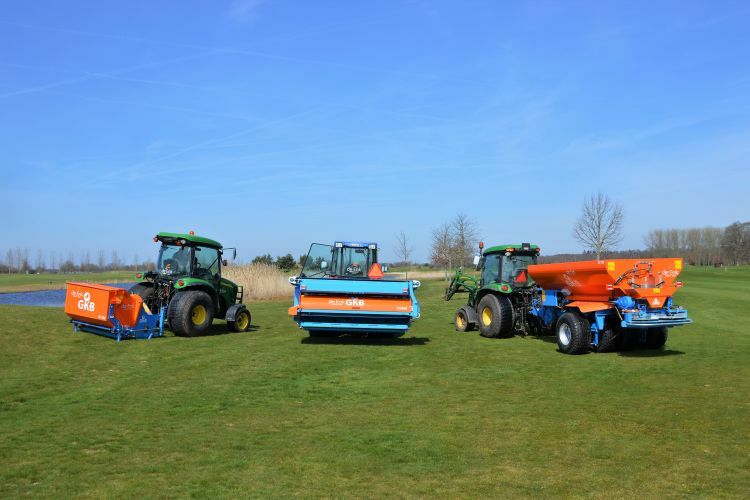 Together with Jan-Willem Kraaijeveld, sales- and development manager at GKB, the head greenkeeper of Prise d’Eau discussed his ideas on what the Sandspreader should be able to do. Earlier on Vingerhoets had worked together with Jan-Willem when they altered a Sandfiller to the desires of De Enk Groen & Golf, and they kept in touch. 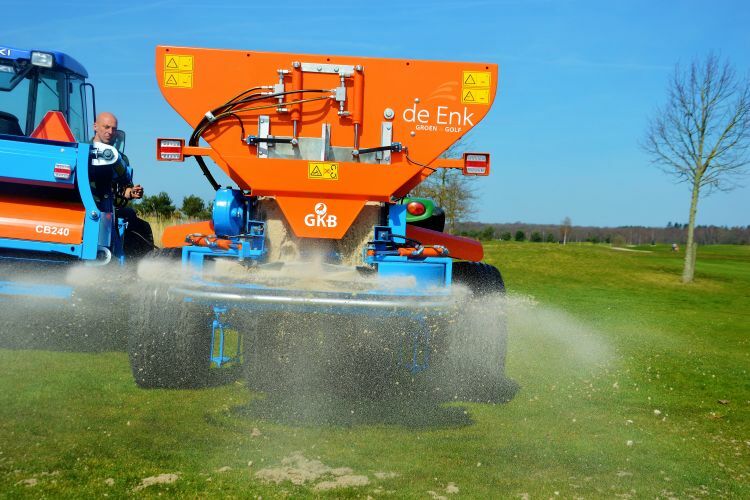 The distinctive adjusted Sandspreader is going to rotate across all golf courses and 270 sports fields, particularly in the Northern-Netherlands, for whom De Enk Groen & Golf is responsible for the maintenance. Nonetheless, it will first be tested and tried in order to find the appropriate settings. Vingerhoets: ‘First, we measure the natural organic matter level of the soil. From there we create a task card, and while using the task card we can determine the sand distribution. If the contours of the fairway become narrower, in that case, the hatch will be shut automatically. What happens is that a hatch on the side of the disc will start to move so that the spreading width is automatically adjusted. Correspondingly, we can keep driving in a straight line, since the machine decides the width which it covers while spreading sand. As of 4 weeks ago, De Enk Groen & Golf has acquired a second Combinator CB240. This multifunctional fraise mowing machine can be equipped with three different types of chisels. In order to fraise mow the surface layer of the course, there are L-shaped fraise chisels. With the hybrid chisels, you are able to remove the surface layer from a hybrid pitch, without damaging the synthetic fibers. However, that is not applicable on a golf course. The old turf is fraised off from the field, to be replaced by new turf immediately. Or it is decided to only remove a thin layer of the surface so that the root system om the grass stays untouched and only the weed and other contamination are removed. The removed material is directly moved onto a conveyor and elevator belt to be loaded into a dump truck or trailer. 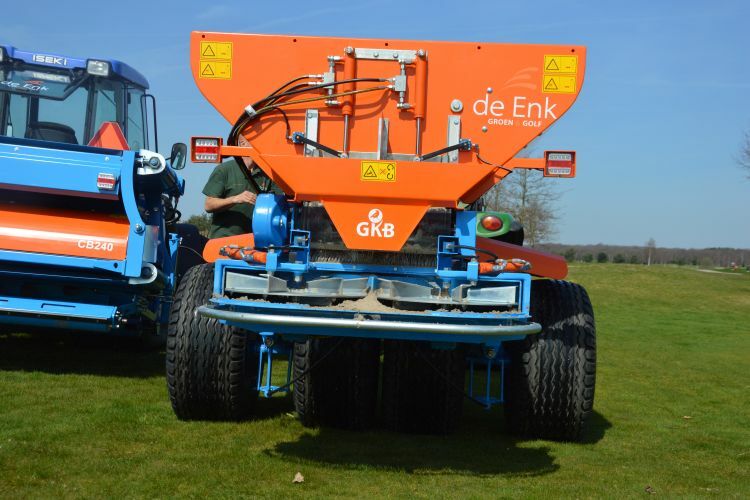 During last year the Combinator was acquired, resulting in the fact that De Enk has two running fraise mowing machines. In just one operation they are able to remove 2.40 meters. Vingerhoets has not worked with the Combinator yet; however, he has worked with the Sandfiller, a machine that can scarify, remove, and fill sand into several narrow gullies in just one single operation. Therefore, it is possible to work this machine with just one man. 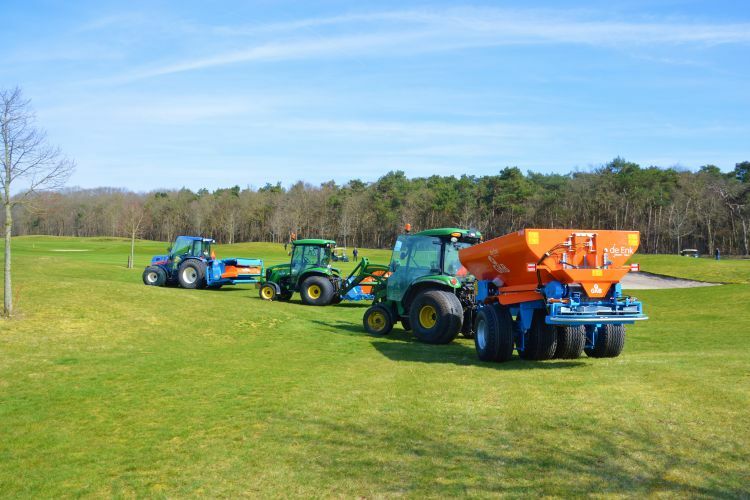 This Sandfiller was acquired by De Enk Groen & Golf on March 1st in 2016 when the activities of Grontmij were incorporated. To return to the SP300 again. If this model satisfies de Enk, they want to deploy a similar machine with a different size on the greens. Vingerhoets: ‘In that case, it means that we can distribute sand within the outlines of the green and not outside of those outlines. Meaning that we can save sand. We only want to use sand for areas that actually need the sand. We are also prescribing driving directions on the course, so we try to look for the most efficient driving directions. We can adjust the spreading with of the machine. If we have the task card, this machine will immediately know what to do. In principle it is a similar machine to our fertilizing machine that works with GPS; it highlights the areas it has covered. We make sure to map the soil, so that we only operate on areas that need it, with the appropriate means and the appropriate dosage.’ ‘And a decrease in the resources that we use means a decrease in the negative effect on the environment’, Koop adds. To put it in other words, the soil is carefully mapped in a digital chart and all outlines of the course are mapped in a so-called GIS-mapviewer. De Enk Groen & Golf has developed this tool together with geo-advisors. Together with this map viewer, they are able to maintain the golf course interactively, besides the possibility to store data. ‘That particular information is loaded into the computer systems of the mow machines for the fairway, de rough and the greens. Subsequently, we are also able to apply fertilizer using the same technique. And we can use our latest acquisition in a similar way, the SP300 sandspreader. It is extreme precision management on the course in all aspects’, is the conclusion of Vingerhoets.